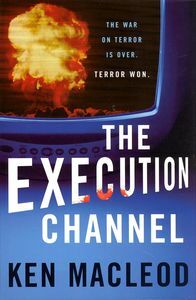 Trying to discuss Ken MacLeod’s The Execution Channel is a lot like chasing a slippery bar of soap over a slick floor: It never stays still, defies any strong grip and presents serious potential for bruised shins in the effort. The novel cloaks itself in misleading genre protocols before revealing itself to be something entirely different, shoving optimism where readers have been conditioned to expect the worst. Alas, a good case can be made that the novel is never as good as when it’s being really, really awful. Like all of MacLeod’s novels so far, it’s an intensely political piece of work. But unlike most of McLeod’s books so far, it’s a near-contemporary thriller that benefits from our familiarity with today’s world. Taking place in a near future where terrorism has grown even more vicious, The Execution Channel begins with a nuclear detonation on British soil, then follows a group of characters as governments go through an acute period of rage in trying to identify and catch the terrorists. There’s a conveniently well-connected family at the center of the story, one with a pacifist daughter, a solider son and a traitorous father. But there’s also a coordinated disinformation effort, a few conspiracy theorists, strong international tensions and a mysterious “execution channel”. One thing’s for sure: MacLeod can do dark like few other writers. From the opening pages, we’re presented with a world that teeters on the brink of irremediableness, a world where the value of bad information has become higher than the true story. A world where viewers can tune in to a channel that solely presents violent executions. A world where conspiracy theorists are markedly better-informed than their saner relatives. A world where paid government operatives deliberately seed misinformation on blogs. A world racing to nuclear war and ever-more powerful weapons. “The War on terror is over. Terror won” says the front-cover blurb, and the impact is profound: Reading The Execution Channel is like taking an all-expense trip to a vision of how bad things could get within half a decade. It’s written like a techno-thriller and reads like a particularly paranoid one: MacLeod has never been so accessible and so depressing. It uses just the slightest amount of future shock to sends current trend to a break point, and seeds just enough new ideas into the mix to please SF fans. But if The Execution Channel looks like something at first, it doesn’t necessarily mean that it will stay like that until the end. Throughout the course of the book, MacLeod betrays expectations three times. The first betrayal, that of the world in which the story takes place, is more amusing than consequential. The second betrayal, which shifts the novel’s genres in a fairly spectacular fashion, is clearly announced both by the author’s pedigree and by significant in-story clues. It’s the third betrayal that hurts most, ironically by providing an optimistic conclusion after nearly three hundred pages of increasing grimness: By that point, the fact that some characters will survive the story seems like a disappointment after so much grimness. The biggest irony is that The Execution Channel serves the exact same science-will-save-us-all conclusion that’s been one of SF’s most reliable motif over its decades of existence. But by juxtaposing it onto a realistic framework of real-world horrors, it makes it feel hollow and undeserved. Whether this is reading a message where none were intended, or if the author is trying to tell us something about SF readers’ unrealistic expectations, is left to the reader to articulate.